KIEV, Ukraine -- Ukraine's embattled Prosecutor General Victor Shokin has resigned, according to several lawmakers. The corrupt Viktor Shokin agrees to step down after President Poroshenko asked him to leave office. This comes after Ukrainian President Petro Poroshenko called for Shokin and Prime Minister Yatsenyuk to step down earlier on Tuesday. Poroshenko said the public had "lost trust in the prosecutor general's office" in recent months, in a statement published on a government site. Western leaders and reform-minded Ukrainian officials have long been calling for Shokin's resignation. 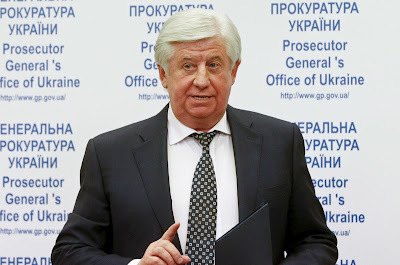 Viktor Shokin was appointed General Prosecutor of Ukraine this February after his predecessors Vitaliy Yarema and Oleh Makhnitskyi were dismissed due to inefficiency in investigating the crimes of top officials during the times of ex-president Viktor Yanukovych. When Shokin was appointed, Ukrainian President Petro Poroshenko said that his main task should be bringing to justice "those responsible for the murders on EuroMaidan last February." Shokin was the third prosecutor general since the Euromaidan movement ousted Yanukovych. He worked as Deputy Chief Prosecutor in 2002-2003, during which time he failed to crack the case of murdered Ukrainian journalist Georgy Gongadze. Gongadze's gruesome murder in 2000 and subsequent release of audio recordings in which the then President Kuchma 'ordered' his killing sparked nationwide protests in 2001 and eventually to the Orange Revolution in 2004. Under Shokin, state prosecutors together with the members of the Security Service of Ukraine (SBU) detained the former head of Yanukovych's ‘Party of Regions' Oleksandr Yefremov, who was, among other charges, accused of financing Russian-backed militants in east Ukraine. Shokin's office also indicted former deputy head of the same party Mykhailo Chechetov, shortly before his alleged suicide, for several crimes, including his voting as an MP for January 16, 2014 'Dictatorship Laws'. Shokin has recently come under criticism following reported lack of independence in establishing an anti-corruption prosecution body. The current committee to select an anti-corruption prosecutor is made up of members of the General Prosecutor's Office (the so-called 'Shokin's Four'), whose credibility has been widely called into question. The EU and Ukraine's Foreign Ministry have several times demanded Shokin to replace the members of the selective committee. However, Shokin not only refused to do it, but also publicly called into question the legality of such demands and accused the Foreign Ministry of hampering visa liberalization. Ukraine Today earlier reported about Auto-Maidan protesters picketing the residence of the Ukrainian president to demand resignation of Shokin. The civic organization Transparency International Ukraine said on November 2, 2015, that Shokin is "personally responsible" for the country's failure to tackle corruption, adding that he is trying to make the Special Anti-Corruption Prosecutor's Office, a new structure responsible for fight against corruption in the government, as dependent as possible on entrenched corrupt bureaucrats.